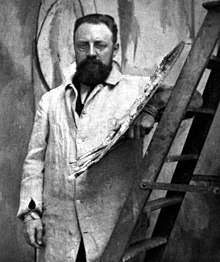 Henri Émile Benoît Matisse (31 December 1869 – 3 November 1954) was a major French artist of the 20th century. Particularly noted for his striking use of colour, Matisse is one of the very few indisputable giants of modern art, alongside Pablo Picasso and Kandinsky. I see with horror that the 'Salon Automne' is looming, for I haven't got, and shan't have, all I meant to be able to show there, the big stillife ['Harmony in Red'] has taken up so much of my time; but since I am content with the outcome, I tell myself one can't hope to be fast as well as good. Quotes, unless otherwise noted, are from 'Notes d'un Peintre' (Notes of a Painter) in La Grande Revue, Henri Matisse (Paris, 25 December 1908); as translated by Jack D. Flam in Matisse on Art (1978). Flam's translation was originally published in 1973. Rules have no existence outside of individuals: otherwise a good professor would be as great a genius as Racine. I simply try to put down colours which render my sensation. There is an impelling proportion of tones that may lead me to change the shape of a figure or to transform my composition. Until I have achieved this proportion in all the parts of a composition I strive towards it and keep on working. Then a moment comes when all the parts have found their definite relationships, and from then on it would be impossible for me to add a stroke to my picture without having to repaint it entirely. What I dream of is an art of balance, of purity and serenity, devoid of troubling or disturbing subject matter, an art which could be for every mental worker, for the businessman as well as the man of letters, for example, a soothing, calming influence on the mind, something like a good armchair which provides relaxation from physical fatigue. What I am after, above all, is expression. Sometimes it has been conceded that I have a certain technical ability but that, my ambition being limited, I am unable to proceed beyond a purely visual satisfaction such as can be procured from the mere sight of a picture. But the purpose of a painter must not be conceived as separate from his pictorial means, and these pictorial means must be the more complete (I do not mean complicated) the deeper is his thought. I am unable to distinguish between the feeling I have for life and my way of expressing it. In a picture every part will be visible and will play the role conferred upon it, be it principal or secondary. All that is not useful in the picture is detrimental. Composition, the aim of which is expression, alters itself according to the surface to be covered. If I take a sheet of paper of given dimensions I will jot down a drawing which will have a necessary relation to its format – I would not repeat this drawing on another sheet of different dimensions, for instance on a rectangular sheet.. ..a drawing must have a power of expansion which can bring to life the space which surrounds it. I want to reach the state of condensation of sensations which constitutes a picture. Perhaps I might be satisfied momentarily with a work finished at one sitting, but I would soon get bored looking at it; therefore, I prefer to continue working on it so that later I may recognize it as a work of my mind.. I try to condense the meaning of this body [of a woman] by drawing its essential lines. The charm will then become less apparent at first glance, but in the long run it will begin emanate from the new image. This image at the same time will be enriched by a wider meaning, a more comprehensively human one, while the charm, being less apparent, will not be its only characteristic. It will be merely one element in the general conception of the figure. If upon a white canvas I jot down some sensations of blue, of green, of red – every new brush stroke diminishes the importance of the preceding ones. Suppose I set out to paint an interior.. .If I paint a green near the red, if I paint in a yellow floor, there must still be between this green, this yellow, and the white of the canvas a relation that will be satisfactory to me. But these several tones mutually weaken one another. It is necessary, therefore, that the various elements that I use be so balanced that they do not destroy one another.. The chief aim of color should be to serve expression as well as possible. I put down my colors without a preconceived plan. If at the first step and perhaps without my being conscious of it one tone has particularly pleased me, more often then not when the picture is finished, I will notice that I have respected this tone while I have progressively altered and transformed the others. I discover the quality of colors in a purely instinctive way. To paint an autumn landscape I will not try to remember what colors suit this season, I will only be inspired by the sensation that the season gives me; the icy clearness of the sour blue sky will express the season just as well as the tonalities of the leaves. My sensation itself may vary, the autumn may be soft and warm like a protracted summer or quite cool with a cold sky and lemon yellow trees that give a chilly impression and announce winter. My choice of colors does not rest on any scientific theory; it is based on observation, on feeling, on the very nature of each experience. I.. ..merely try to find a color that will fit my sensation. There is an impelling proportion of tones that can induce me to change the shape of a figure or to transform my composition. Until I have achieved this proportion in all the parts of the composition I strive towards it and keep on working. Then a moment comes when every part has found its definite relationship, and from then on it would be impossible for me to add a stroke to my picture without having to paint it all over again. What interests me most is neither still life nor landscape but the human figure. It is through it that I best succeed in expressing the nearly religious feeling that I have towards life. I do not insist upon the details of the face. I do not care to repeat them with anatomical exactness. Though I happen to have an Italian model whose appearance at first suggests nothing but a purely animal existence, yet I succeed in picking out among the lines of his face those which suggest that deep gravity which persists in every human being. A work of art must carry in itself its complete significance and impose it upon the beholder even before he can identify the subject-matter. When I see the Giotto frescoes at Padua I do not trouble to recognize which scene of the life of Christ I have before me, but I perceive instantly the sentiment which radiates from it and which is instinct in the composition in every line and color. I know that Seurat is completely the opposite of a romantic, which I am, but with a good portion of the scientific, of the rationalist, which creates the struggle from which I sometimes emerge the victor, but exhausted. The work of Renoir, after that of Cézanne whose great influence had been manifested among artists, save us from whatever drying effect there is in pure abstraction. The rules that one might deduce in considering the work of these two masters appear to be more difficult to discover in the work of Renoir, who hides his efforts better. Whereas the continuous tension of the mind of Cézanne, his lack of self-confidence, prevent him from giving himself to us entirely even though he shows the evidence of his corrections, from which are easily (too easily) deduced rules that have a mathematical precision. [critical quote on Cubism ]. Slowly I discovered the secret of my art. It consists of a meditation on nature, on the expression of a dream which is always inspired by reality. With more involvement and regularity, I learned to push each study in a certain direction. Little by little the notion that painting is a means of expression asserted itself, and that one can express the same thing in several ways. Exactitude is not truth, Delacroix liked to say. original version in French: Je vous répéterai ce que je disais naguère à Guillaume Apollinaire: "Je n'ai, pour ma part, jamais évité l'influence des autres, j'aurais considéré cela comme une lâcheté et un manque de sincérité vis-à-vis de moi-même." I don't paint things. I only paint the differences between things. Je ne peins pas les choses. Je ne peins que les différences entre les choses. "Henri Matisse: contre vents et marées : peinture et livres illustrés de 1939 à 1943"
Tomorrow, Sunday, at 4 o'clock, visit from Picasso. As I'm expecting to see him tomorrow, my mind is at work. I'm doing this propaganda show [at the Victoria and Albert Museum in London, 1945] with him. I can imagine the room with my pictures on one side, and his on the other. It's as if I were going to cohabit with an epileptic. The future painter must feel what is useful for his development – drawing or even sculpture everything that will let him become one with Nature, identify himself with her, by entering into the things – which is what I call Nature – that arouse his feelings. I believe study by means of drawing is most essential. If drawing is of the Spirit and color of the Senses, you must draw first, to cultivate the spirit and to be able to lead color into spiritual paths. Dessiner avec les ciseaux: découper à vif dans la couleur me rappelle la taille directe des sculpteurs. La verticale est dans mon esprit. Elle m'aide à préciser la direction des lignes, et dans mes dessins rapides je n'indique pas une courbe, par exemple, celle d'une branche dans un paysage, sans avoir conscience de son rapport avec la verticale. Mes courbes ne sont pas folles. Un musicien a dit: en art la vérité, le réel commence quand on ne comprend plus rien à ce qu'on fait, à ce q'uon sait, et qu'il reste en vous une énergie d'autant plus forte qu'elle est contrariée, compressée, comprimée. Il faut alors se présenter avec la plus grande humilité, tout-blanc, tout pur, candide, le cerveau semblant-vide, dans un état d'esprit analogue à celui du communiant approchant la Sainte Table. Il faut évidemment avoir tout son acquis derrière soi et avoir su garder la fraîcheur de l'Instinct. Si je crois en Dieu? Oui, quand je travaille. Quand je suis soumis et modeste, je me sens tellement aidé par quelqu'un qui me fait faire des choses qui me surpassent. Pourtant je ne me sens envers lui aucune reconnaissance car c'est comme si je me trouvais devant un prestidigitateur dont je ne puis percer les tours. For a long time now I've been conscious of expressing myself through light or rather in light. We are born with the sensibility of a period of civilization. We are not masters of our production; it is imposed upon us. [I wouldn't mind turning into] a vermilion goldfish. It is only after years of preparation that the young [artist] should touch color — not color used descriptively, that is, but as a means of personal expression. I have always tried to hide my efforts and wished my works to have the light joyousness of springtime which never lets anyone suspect the labors it has cost me..
My verse forms are relatively traditional (traditions alter). In general they have moved away from strict classical patterns in the direction of greater freedom — as is usual with most artists learning a trade. It takes courage, however, to leave all props behind, to cast oneself, like Matisse, upon pure space. I still await that confidence. We are not here in the presence of an extravagant or an extremist undertaking: Matisse's art is eminently reasonable. I have seen Matisse's that were more 'unfinished' and yet more 'finished' than any American painters. Matisse was obviously in a terrific emotion at the time and he was more ’unfinished’ than 'finished'. William Baziotes (1950), as quoted in Artists' Session at Studio 35, 1950 (1990) p. 216. Unlike the essentially naturalistic colour opposition of yellow-blue/violet which characterized the Impressionist colour, Matisse began to exploit the more abstract, and... vibrant, oppositions of red-green. Because red and green colours are the closest in tone of all the complimentary colour pairs, they set up a dazzling sensation which gives its own light and brilliance, without any direct imitation of natural effects of light. Thus the properties of colour itself, and the interactions of colour... were the basis of Matisse's mature art. Colour no longer stood for, or symbolized, anything external to painting itself; it was colour as colour. Civilization is an active deposit which is formed by the combustion of the Present with the Past. Neither in countries without a Present nor in those without a Past is it to be encountered. Proust in Venice, Matisse's birdcages overlooking the flower market at Nice, Gide on the seventeenth-century quais of Toulon, Lorca in Granada, Picasso by Saint-Germain-des-Prés: there lies civilization and for me it can exist only under those liberal regimes in which the Present is alive and therefore capable of assimilating the Past. Picasso is taking Cézanne's elements — the cone, cylinder and sphere — into Cubism. Matisse is taking Cézanne's interest in the wholeness and the clarity of figures. They're taking almost opposite interpretations of what they see in Cézanne: Picasso is understanding it as decomposition, and Matisse is understanding it as composition. John Elderfield (MoMA-curator and Matisse scholar) as quoted by Paul Trachtman, "Matisse & Picasso", Smithsonian Magazine (February 2003), p. 4. Matisse... had first studied law and then spent [six] years as an art student... In the years following the 1900 World's Fair he struggled with poverty ...and with a good deal of public indifference toward his work. During that time, he worked his way through the different modes of vision employed in nineteenth-century avant-guard painting, starting with the impressionists and then moving on to Seurat, van Gogh, Gauguin, and especially Cézanne, who was to remain the greatest and longest-lasting source of inspiration to him. As early as 1899, Matisse made great sacrifices in order to buy a small but powerful Cézanne, Three Bathers, and he was the first of the younger avant-guard artists to absorb the radically new kind of pictorial thought that Cézanne's painting embodied. Cézanne was... Matisse said, "a sort of god of painting." Jack Flam, Matisse and Picasso: The Story of Their Rivalry and Their Friendship (2003) pp. 4-5. As Picasso began to occupy the territory of Cézanne, Matisse seemed to be moving closer to the legacy of van Gogh and Gauguin... pushed to find a new and different way of dealing with the fluidity and dynamism... in Cézanne... by turning even more intensely toward the decorative. During most of 1908... Matisse continued to work with flat forms and to explore the inherent ambiguities of the pictorial field—especially... the sensation of limitless space and to have... the background become... more important than the figures it contained. Since childhood he had loved textiles, and he had an acute understanding of the possible symbolic uses for decorative patterns—as in van Gogh's portraits of Madame Roulin as "La Berceuse," in which the floral pattern... becomes a metaphor for her vitality and fertility. Matisse's use of decorative patterning also provided... another way of holding emotion at arm's length while maintaining its intensity. It allowed... a pictorial space... sufficiently open and imaginative to incorporate a... range of contrasting visual rhythms... to evoke different... perceptual sensations. Such a fluid and open space enabled him to invest everyday subjects with... spirituality. Jack Flam, Matisse and Picasso: The Story of Their Rivalry and Their Friendship (2003) pp. 61-62. The more Matisse's body failed, the more he responded by inventing a mythic youthfulness that he could inhabit in his art. For Matisse, the first rule was to keep his art separated from the literal representation of the feelings behind it, to channel and redirect his emotions into imagery that transcended the raw stuff of life. Jack Flam, Matisse and Picasso: The Story of Their Rivalry and Their Friendship (2003) p. 206. Pablo Picasso (1954, shortly after the death of Matisse) as cited by Paul Trachtman, "Matisse & Picasso", Smithsonian Magazine (February 2003), p. 7. Pablo Picasso (1960's) as cited by Paul Trachtman, "Matisse & Picasso", Smithsonian Magazine (February 2003), p. 1. Matisse said, you have to read between the lines. When he would stop a line, say, at the ear, and beginning it again at the neck, he was really exercising the viewer's mind to fill in the blanks. Robert Rauschenberg, Barbara Rose interview in Rauschenberg (1987) p. 72. Though produced by a very old man, who was mortally ill, they seem to come from the springtime of the world. Paul Trachtman, "Matisse & Picasso" (with quotes from the 1940's), Smithsonian Magazine, February 2003, p. 4.